Outdoor tap connectors enable you to connect your hose pipe to your garden tap with ease and efficiency. They feature a threaded connection - measured in British Standard Pipe (BSP) inches- to allow you to connect 1/2", 3/4" and 1" taps to hose pipes quickly and effectively. 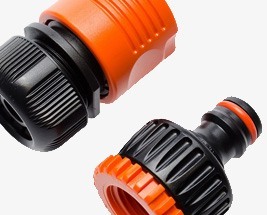 Most tap connectors feature a male quick-click adapter that are attached to hose pipes using female quick-click connectors.